The Sea Dogs College & Trades Fair provides students with the unique opportunity to gather information from colleges as well as meet with college admissions counselors in a social setting at a Sea Dogs baseball game. All students interested in attending the College Fair must have a game ticket for the May 8th Sea Dogs game against the New Hampshire Fisher Cats. Students are eligible to receive two free tickets to the game; additional tickets can be purchased at the discounted rate of $6.00. Students looking to receive their two free tickets to attend the game and the college fair should contact the Sea Dogs Ticket Office at 207-879-9500 or their school's Guidance Office. Each college will have a table set up in the Hadlock Field concourse. Some of the colleges scheduled to participate include the University of Maine at Farmington, Eastern Maine Community College, Saint Joseph's College along with many more. A complete list of participating schools is available at www.seadogs.com. 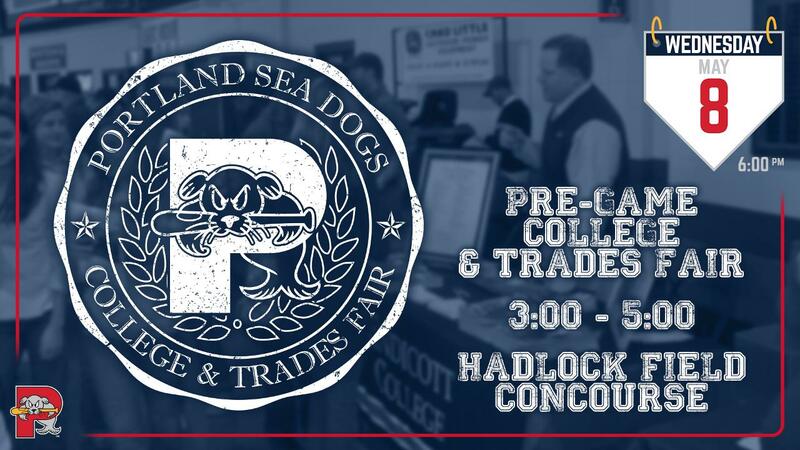 For more information on the Sea Dogs College & Trades Fair, please contact Bryan Pahigian at 207-879-9500 or bpahigian@seadogs.com. The event will be held regardless of weather.